By Evan Turk. Atheneum Books for Young Readers, 2016. 48 pages. $18.99/hardcover; $4.99/eBook. Recommended for ages 4–8. Occasionally a book that is marketed to young children is a treasure trove for everyone. 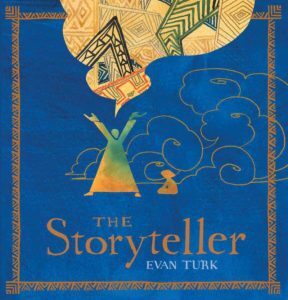 Evan Turk’s book is a wonderful example of the power of the story. In this original tale based in Morocco, Turk has created an unique story that is told with words and art. Both deserve extended attention and thought. Visiting the website thestorytellerbook​.com greatly adds to the enjoyment of the book. From the moment I opened The Storyteller and saw the inside cover, I knew I would be going on an adventure. The inside cover of the book is a map of the Sahara Desert, the Mediterranean, and the Middle East, filled with zigzag designs in shades of earth brown and sea blue. The story has the shape of a folktale. The people no longer listen to the storytellers, and the fountains have gone dry. In the desert, a sandstorm gathers energy and takes the form of a powerful djinn, threatening to return the village to the desert. At the same time, a thirsty boy goes to the Great Square searching for a drink of water. The last water seller gives the boy a brass cup and instructs him to share any water that he might find. This begins the story. An old man, a storyteller, invites the boy to sit down, and his thirst will be quenched. The story he tells fills the boy’s cup with water, which the boy immediately drinks. The pattern is repeated, and contains a story within a story within a story. At the end of the book, the boy is the storyteller; the people listen; the fountains are full again; and the village is saved. The story itself is familiar and comfortable. The structure reminds one of One Thousand and One Nights because, like Scheherazade, the storyteller repeatedly postpones the ending of the tale. Turk’s use of language heightens the metaphor of the story. For example, he writes: “The old man’s voice rumbled like a spring,” and the storyteller’s “voice poured out.” Turk’s use of color and design tell the same story with visual images. One of the last illustrations in the book shows the boy (who has a remarkable resemblance to a storyteller whom Turk met in Morocco) telling a story to a circle of people. The blue rings around the boy remind us of water. The website gives us an understanding of Moroccan traditions, such as the weavers and the water sellers to name a few. We become familiar with a few Arabic words and their pronunciations from a native speaker. Instructions for activities such as painting, weaving, and gathering stories are also included on the website. The images in The Storyteller demonstrate the integrity in Turk’s story. He traveled to Morocco to conduct research, and his artwork is evidence of the diversity of present‐day Morocco. There is a blend of tradition and western culture in his illustrations. For example, one image is of a motor scooter next to a horse‐drawn cart. Many of the images in the book are recognizable likenesses of people and places Turk saw when he visited Morocco. The book invites us to enhance our understanding of Moroccan culture. The linking of water with the essential nature of the story is an important message for our youth today. The story gives a hopeful message, doing what the art of storytelling does: inspires one to tell stories and stimulates curiosity and learning. The book, in and of itself, is a treasure. When it is combined with the resources offered on the website, The Storyteller provides a beautiful curriculum for First‐day school teachers, intergenerational lessons, and personal learning experiences. I am most eager to share my appreciation of this book in First‐day school and at any other opportunity that may arise.